Habitat: Mountain forests; 800-1400 m.
Description: The plant is a vigorous, woody, twining vine (liana) or climbing shrub. It is not unusual for a healthy vine to cover an area 10 to 15 feet wide, 18 to 24 feet long and 9 to 12 feet high. In cultivation it is supported on a trellising system. The large, deep green, leathery leaves are oval to nearly circular and 7 to 10 inches in diameter. Young leaves and shoots are coated with red hairs, while mature leaves are dark green and hairless on the upper surface, downy-white with prominent, light colored veins beneath. The large (1 to 2 inch diameter), white to cream colored flowers are somewhat fragrant and produced as singlets to triplets in the leaf axiles. The flowering period extends over several weeks from early May to June, depending on climatic conditions. The plants are dioecious, bearing either male or female flowers, thus needing plants of both sexes to produce fruit. Self-fruiting males are known to exist but produce less desirable fruit. The oval, ovoid or oblong fruit is up to 2-1/2 inches long, with russet-brown skin densely covered with short, stiff brown hairs. The flesh, firm until fully ripe, is glistening, bright green or sometimes yellow, brownish or off-white, except for the white, succulent center from which radiate many fine, pale lines. Between these lines are scattered minute dark-purple or nearly black seeds, unnoticeable in eating. The flavor is sweet/tart to acid, somewhat like that of the gooseberry with a suggestion of strawberry. 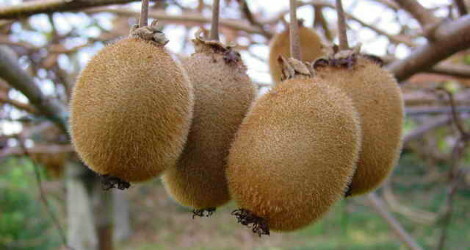 Culture: Kiwifruit prefer somewhat acid (pH 5 - 6.5), well-drained soils that are rich in organic matter. 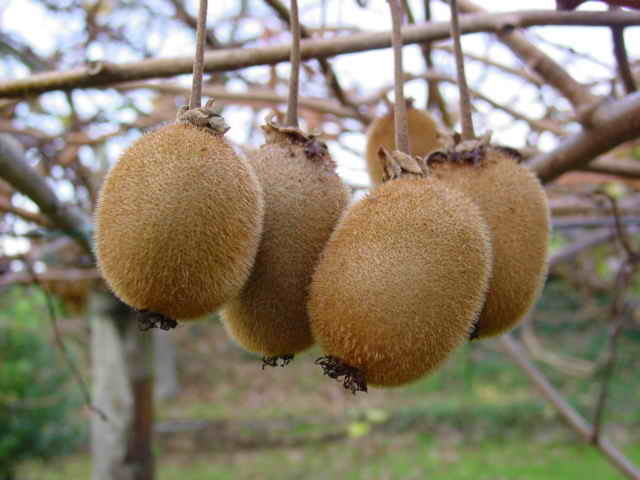 Kiwifruit plants need large volumes of water during the entire growing season but must also be in well-drained soils. Plants are heavy nitrogen feeders which should be applied in abundance during the first half of the growing season. Images #00 (cropped & #01 (original) by Luis Miguel Bugallo Sánchez (Lmbuga)Copyright: GFDL (GNU Free Documentation License)Publicada por/Publish by: Luis Miguel Bugallo Sánchez (Galipedia, a wikipedia galega) [GFDL or CC-BY-SA-3.0], via Wikimedia Commons. Last accessed on Thursday, October 26, 2017. 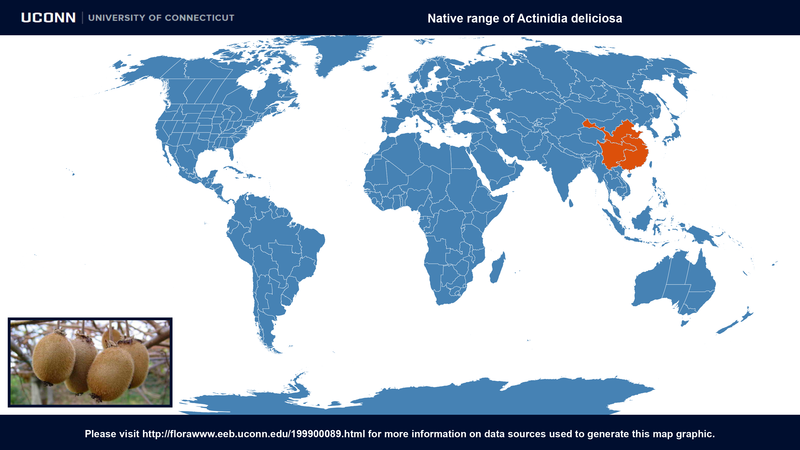 Actinidia chinensis var. deliciosa at Flora of China. Last accessed on Thursday, October 26, 2017.